It was an overcast and misty start to the day, but that didn’t dampen anyone’s spirits, as anticipation and nervous energy filled the air. The shooters were all ready for an exciting final, with all to play for. 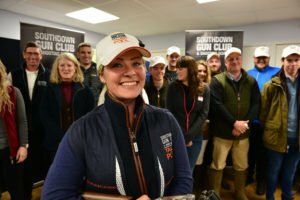 Alongside a dedicated shooting competition, each of the finalists had a video interview with Edgar Bros Director Lisa Riley, and Southdown Managing Director Shaun Miller to determine their potential to be an ambassador for the brands, Southdown, Zoli Gun and NSI. Whilst shooting ability is a pre-requisite, social media is also a big part of the Talent Pool winner’s platform. Luckily, the rain came once the shooting had finished and the deliberation began. It was such a close competition that the finalists were initially shortlisted to three, before a winner was selected. For the first time, a lady shot was chosen – Sammy Halsey was named the champion of Talent Pool 2018! Sammy, 29 is an events planner from Buckinghamshire with a passion for shooting that only began two years ago. She has previously shot with the Shotgun & Chelsea Bun Club and the Femme Fatales, and set her sights on Talent Pool after discovering a natural talent for the sport. She is already an accomplished horse woman and hopes to have the same success in the world of shooting. Talent Pool will give her the opportunity to develop her clay pigeon shooting skills with a view to competing at a national level. Sammy wins a fantastic package including a year-long mentoring programme with coaching and support from Southdown Head Coach, Simon Arbuckle. Alongside this, she will receive a Zoli ‘Z-Gun’ competition shotgun for the duration of her winning year, thousands of Nobel Sports Italia cartridges and branded clothing so she truly looks the part. To ensure she gets the opportunity to shoot, she will also get complimentary competition entry fees, free Southdown practice clays and CPSA membership including insurance, all as part of the package.